The title serves to identify the recipe and is only seen by you when you use the software. You can think of the title as analogous to a file name for a file in your computer. The name is what your clients will see once you print the recipe. Generally speaking, the title should be short and concise, and the name can be a bit longer. Let's demonstrate with an example. Below you can see a recipe for omelette 3 eggs. 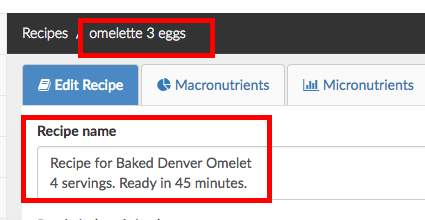 When opening the recipe, you can see that omelette 3 eggs shows on the black bar at the top of the screen (acting similar to a filename) and that the name property is shown below as Recipe for Baked Denver Omelet. 4 servings. Ready in 45 minutes. As you can see, it is possible to add more content to the recipe name. To change the recipe name, you can simply edit the text in the box highlighted in the screenshot above and then click the save button. On the other hand, to change the recipe title you will have to go back to the recipes screen, then click on Actions for your recipe, and then click on Rename recipe as shown below. This will open a modal window where you will be able to change the title of your recipe. When you add a recipe to a meal plan, the title will show in the meal plan table, and the name will show in the recipes tab. Let's illustrate with an example. When you click on Add recipe in a meal plan, you will be able to choose your recipe by its title. The title identifies your recipe. When you click on Add to plan, the recipe's title (the short one) will shown in the meal plan table. If you click on the recipe's tab though, you will see the name as highlighted below. This is also what your clients will see when you print the meal plan. You can choose to have different title and name for your recipes if you want to add extra detail in the name, or you can opt for always keeping them the same for consistency and to avoid confusion. The choice is yours.